This cool science kit teaches children about alternative energy sources and conservation while building a windmill generator that powers an LED light. 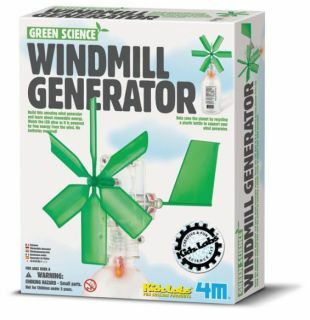 Help save the planet by recycling a plastic bottle to support your wind generator. Windmill Generator size at 13cm long. Contents: 1 rotor, 1 front-housing with grear and rotor shaft installed, 1 black housing, 2 half screw caps, 1 tail, 1 toy motor with gear (generator), 1 motor cover, 8 small screws, 1 LED unit with wires and detailed assembly instructions, including ''How it works'' and fun facts.